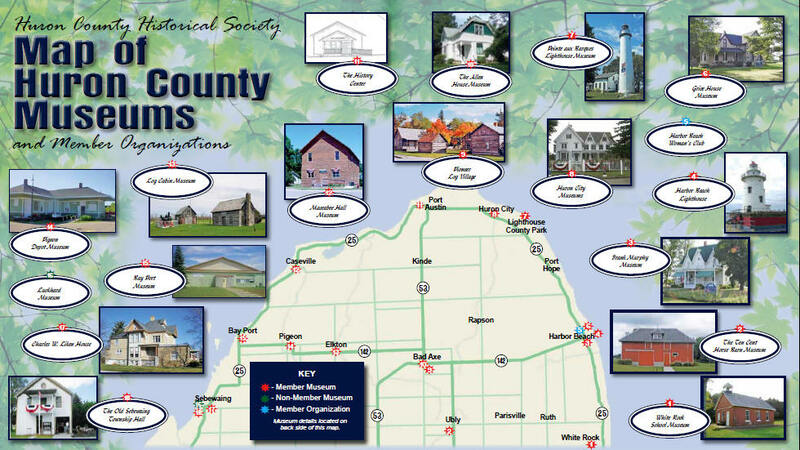 The Huron County Historical Society invites you to take a trip back in time and visit one of the many museums available to the public that portrays Huron County's rich and colorful past. We would especially like to invite you to attend a Countywide museum event - all museums will be open the last weekend in September. Please watch for updated brochures each summer. Admission fees, if any, are in the information below, along with their regular operating hours. 7995 Pioneer Drive 989-428-4123 www.huroncitymuseums.org Open July and August, Fridays and Saturday 10 am - 4 pm. For Museum Weekend, call 313-331-7371 for private tours. Admission fees apply. 1424 Pointe aux Barques Rd. 989-550-5532 Currently under construction, but will be open in 2012. Call for donations and up-to-date information. 12 - Maccabee Hall Museum - Caseville 6733 Prospect Street 989-856-9090 Open Wednesday through Saturday 11:30 am - 4:30 pm. Open year round. Caseville historical museum located in the old Maccabee Hall, built in the 1890's. Sebewaing. 590 E. Bay Street.